Kampala South Metropolitan Police Commander Siraj Bakaleke is alleged to have masterminded the scheme. File photo. Police have confirmed that five of its officers are under investigation for allegedly extorting about Shs1.4 billion from two South Korean nationals. Mr Vincent Ssekate, the spokesperson of the Professional Standards Unit (PPS), said some of the implicated officers are detained at Nalufenya Detention Facility while others have recorded statements. Mr Ssekate could not divulge names of the suspects for fear of jeopardizing investigations but sources told this website that the suspects in detention include three operatives George Kayongo, Kenneth Zirintuusa and Patrick Ochen as well as Isaac Munezero, the crime intelligence officer at Katwe Police Station. 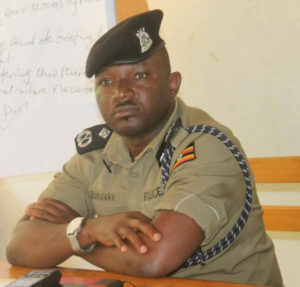 Sources add that Kampala Metropolitan South Regional Police Commander Siraj Bakaleke, who is alleged to have masterminded the scheme, recorded a statement on Tuesday in relation to the matter and was released on police bond. However, Bakaleke has denied making any statement in relation to the incident, insisting that his appearance at PPU was part of his normal operational reporting procedures. The Kampala Metropolitan police also described as fake news allegations that Mr Bakaleke has been arrested over the matter. Sources privy to police investigations have intimated to this website that the implicated police officers intercepted intelligence information that the two South Korean nationals Park Seunghoon and Jang Shingu Un were in the country to buy gold worth more than $1.5 million and were, through their lawyer, set to meet gold dealers at Acacia Mall. Sources said the police officers swung into action and deployed at Acacia Mall. It is said when the Koreans arrived at the meeting venue, they were instead surrounded by the armed officers and arrested. The police officers reportedly ordered the two Koreans to hand over the money before they were detained at Katwe Police Station, where they spent the next two days. The two Koreans, in a statement at police, claim that the police officers then attempted to deport them back to their home country and bought two air tickets. However, the sources add that in the process of transporting the duo, they missed the flight. It is said at the police officers then tried to book them on another flight but were then intercepted by Flying Squad operatives, who arrested the three police officers escorting the suspects.